Lyon Zhang takes a breath. The freshman and the Cats will take on three opponents this weekend. Northwestern heads to Carbondale, Illinois, this weekend for a two-day meet against Missouri, Kentucky and Southern Illinois. Last week, the Wildcats (2-3) dominated, winning 12 of 14 events and defeating both the University of Chicago and Illinois-Chicago. However, as senior Alex Snarski said Saturday, the local rivals didn’t test NU. The upcoming meet will be more competitive, junior Will Hofstadter said. Hofstadter has been a force for the team this season, with four individual first-place finishes so far. 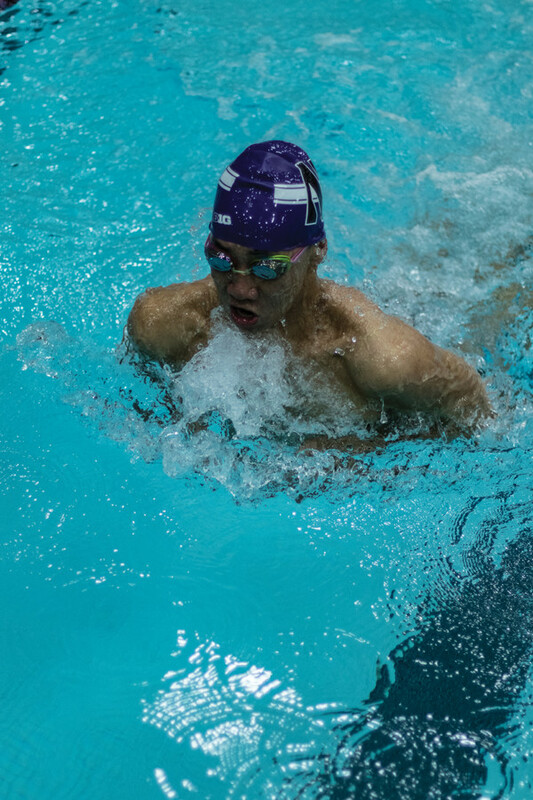 The junior said he is strongest in the breaststroke events, but will start swimming freestyle sprint races as well. Hofstadter said the weekend’s two-day meet structure will allow him and his teammates to compete in events they don’t normally swim. Freshman Liam Gately is one of those teammates. Usually a distance swimmer, Gately said he will also be swimming in the 200-yard freestyle and competing in a relay in addition to his regular slate, which features the 500-yard and 1000-yard freestyles. He said the meet will be crucial as NU hopes to close the fall season strong. As the Cats approach the end of their fall season, junior Tyler Lis said their training has picked up in pace. Part of that, he said, involves more individualized workouts instead of early-season sessions designed to get the whole team fit. This season, Lis said his main focuses are the 200-yard individual medley and the 200-yard backstroke. Against Georgia Tech, Lis swam a 1:49:94 in the 200 back, the team’s fastest time this season. Last weekend, NU competed alongside the women’s team. Lis said the experience was beneficial, and he hopes the men can repeat that enthusiastic atmosphere by themselves in Carbondale.